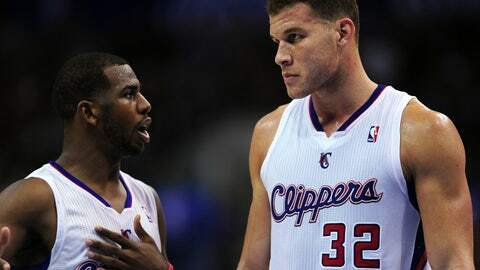 The Clippers maintained their lead in the Pacific Division and held the fourth spot in the Western Conference. The Clippers play four games in six nights beginning Monday at Staples Center against the surprising Phoenix Suns (18-11). They also have a New Year’s Day game against Charlotte, then play back-to-back road games at Dallas and San Antonio to end the week. What a week. Tough road losses on consecutive nights at Golden State and Portland in overtime were followed by Saturday night’s strong showing at home against the Utah Jazz, a win the Clippers badly needed. At 21-11, the Clippers maintained their lead in the Pacific Division and held the fourth spot in the Western Conference behind Oklahoma City, Portland and San Antonio. The Clippers are tied with the Houston Rockets but have a better record within the conference (15-5) and are 13-2 at home. In @blakegriffin32's last 7 games including tonight, he's averaging 28.4 PTS, 11.4 REB, and 3.1 AST on 55%FG and 79%FT. Look out #NBA. Stephen Jackson’s reputation as an NBA problem child took a hit last week when he turned into a Christmas gift giver. All players received a Galaxy Note tablet from league sponsor Samsung, but Jackson gave his away to a worker at Oracle Arena. Nice gesture from a guy who’s had his share of troubles. The NBA blew it. When officials gave Clippers forward Blake Griffin a technical foul last Wednesday night at Golden State, it potentially cost the Clippers the game. The league acknowledged the error — all Griffin was trying to do was escape Andrew Bogut’s grasp — but it was too late. It was Griffin’s second tech of the game, meaning automatic ejection. It never should have happened. Griffin is heating up. He has scored 30 or more points in three of his past four games and totaled a season-high 40 Saturday night against the Jazz. Better yet, Griffin has converted on 28 of 47 shot attempts over two games and has developed into a reliable free-throw shooter, making 70 percent or more in seven of eight games. Is this the best you've played in your career? @blakegriffin32: "It might be. The best part about it is we've won games"
Point guard Chris Paul came awfully close to a triple-double Saturday night against the Jazz, finishing with 21 points, 10 rebounds and nine assists. Paul also had five steals– a phenomenal night for most players but typical for him.